Tomorrow is Arbor Day. Celebrate with The Secret Lair. | Kris Johnson's Blog…sort of. Tomorrow is Arbor Day. Celebrate with The Secret Lair. The first panel of Natalie Metzger‘s latest webcomical creation for The Secret Lair provides an insight—one some might classify as profoundly disturbing—into the decidedly non-traditional celebrations Chris Miller and I have adopted for certain of the minor holidays observed here in the United States. 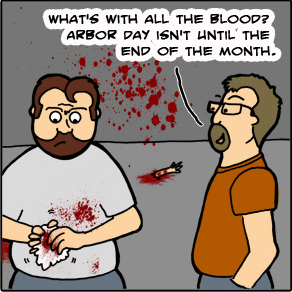 If you are in northeast Ohio this Arbor Day, you would do well to avoid The Secret Lair. ((The facility and its immediate surroundings are slightly out of phase with the “normal” time/space continuum; we expect the issue to be resolved no later than Wednesday of last week.)) However, admission to The Holden Arboretum is free beginning on Friday the 25th and continuing through Sunday the 27th. Mr. Miller and I are—due to the aforementioned non-traditional observances—banned from the grounds for life, but we hold no grudge and encourage you to visit the Arboretum this weekend if you are able.